>> Should You Use a Behavior Chart? Should You Use a Behavior Chart? If you look around the internet, you’ll find vast & varied opinions on classroom behavior charts. From “they’re evil” to “they’re the best thing in the world” and everything in between. A few articles (like this one) discuss how teachers who used to use behavior charts decided to ditch them and are so glad they did. So all this has me thinking, and I’m guessing it has some of you a little confused. My goal today is to clear up a little bit of the confusion (and the guilty) surrounding this question. I don’t have time in this post to go into all the pros and cons of using a behavior chart, but I do want to hit a few highlights before offering what I think is a unique perspective on this whole thing. They can help keep your class under control. If you’re having trouble keeping your class in order, this can be a great tool. Students have a visual reminder that they need to change their behavior, and you have a plan in place & the confidence that you know how to work your plan. They are not the end-all be-all. Any teacher will tell you that behavior charts do not solve all classroom problems. That’s because all they can do is track behavior, not help kids confront the root issues. They’re a tool, but they’re not a perfect solution. So maybe behavior charts aren’t the best solution after all. They don’t really help us build relationships or reach the students’ hearts. Should we just ditch them altogether? Should we just ditch them altogether? I know, not much of an answer….I’m trying to get there….But first two important truths. Truth #1: You can’t build strong relationships with your students if your class is out of control. The most effective teachers have strong relationships with their students – there’s no doubt about it. But if your class is out of control, you’re going to have a hard time building those relationships – not to mention you’re going to feel like pulling your hair out every day. New teachers especially tend to get themselves in trouble by trying to get their students to like them before they establish any authority. It sounds good in theory but it doesn’t work well in reality. In order to have strong relationships with your students, you have to first be able to control & manage your class. Truth #2: Teaching is a Journey. What I mean is that the teacher you will be in 5 years is not the same teacher you are now. And that’s okay. From my point of view, it would be an excellent goal to one day have a classroom that runs efficiently without a behavior chart. But I have to tell you, most first-year teachers are going to have a seriously hard time managing their classroom without some type of formally structured behavior plan. There are just too many nuances and they don’t have enough confidence. 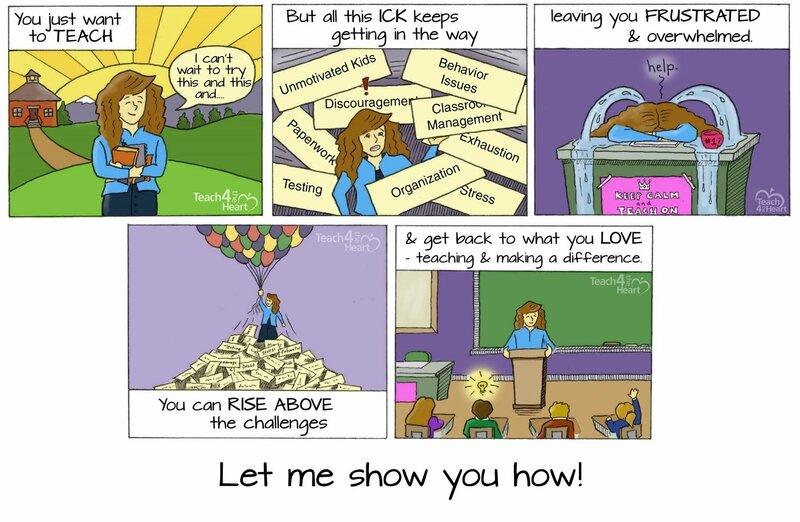 Take me, for example – when I started teaching I was really nervous about dealing with discipline problems. So I didn’t deal with them, and before long my students were running the show. I was not effective. How could I be? A structured behavior plan (including writing names on the board – I explain it here) pretty much saved me. It was definitely the right call. A few years later, however, such a formal system wasn’t as important. I used it the first few weeks of school and then pretty much phased it out for most of my classes. Why the change? Because I had the experience & was confident that I could deal with whatever happened. My students could see I was on top of things and responded much better. So my point is that whether or not you should use a behavior chart might depend on where you are in your teaching journey. Whether or not you should use a behavior chart might depend on where you are in your teaching journey. If you’re a brand new teacher just starting out (or if you’ve been struggling with classroom management), this tool might be just what you need to start the year off right. Pair it with compassion, in-depth conversations, and a focus on building strong relationships, and you’ll likely be good to go. In a few years you can reevaluate and see if you still need it. If you’ve been using a behavior chart for years and years, maybe it’s time to take a second look. Maybe the experience, confidence, and wisdom you’ve gained can be better put to use under a different system. Or maybe you should start the year with a behavior chart but phase it out after a month or two. As you make your decision just keep in mind that it’s better to be an effective, behavior-chart-using teacher than an my-class-is-out-of-control, non-behavior-chart-using teacher. But if you can be MORE effective without one, maybe it’s time for a change. So what do you think? 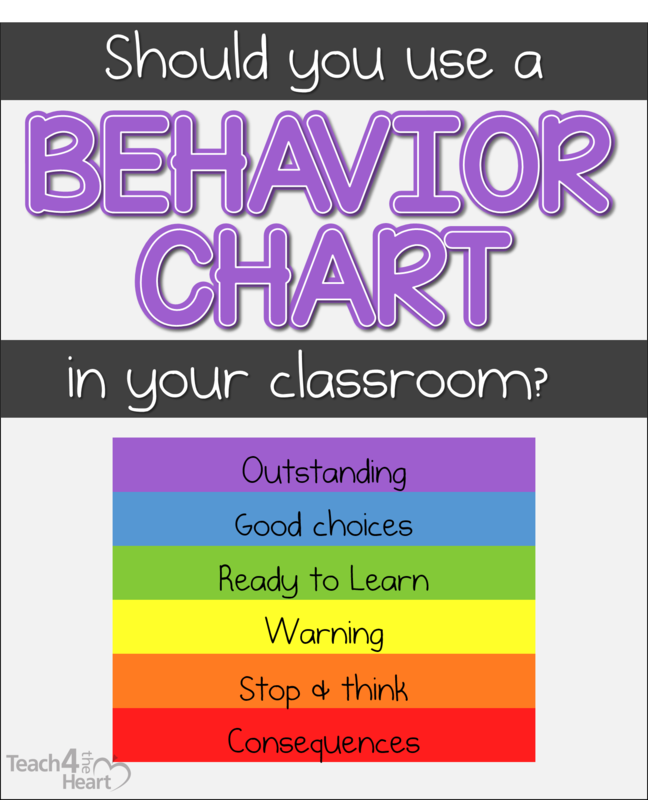 Will you use a behavior chart this year? Those of you who have ditched them, can you please share what you do now instead? I especially liked this: “New teachers especially tend to get themselves in trouble by trying to get their students to like them before they establish any authority. It sounds good in theory but it doesn’t work well in reality.” Just made this mistake recently-and worst of all, I knew better from previous experience, but assumed things might work differently than the past because of different circumstances this year. Fortunately, I corrected myself in time! WARNING: I wanted to check out the post by on missnightmutters.com that you cited as an example of the negatives of behavior charts, but my avast Antivirus blocked the page with a virus warning! The warnings are sometimes false, but I wouldn’t take the chance. I especially like the using a chart similar to the one you have pictured in your post title in my first grade room. I work in a Christian school, and my principal has entitled them the ‘Redemptive Rainbow!’ They are a great alternative to the Lee Canter change-your-color/card type of system, where the student can only move down and can’t redeem their behavior with wiser choices. I have found that this system is very helpful with kuddos who struggle with impulsivity, because you can catch them making good choices and reward them in front of the class. The only challenge that I have seen, with other teachers in my school, is the ‘correct’ frame if mind thinking about their use. The only teachers who say they don’t like it, are thinking about it wrong. They only clip up kids out of the middle 2, if they are doing something out-of-the-ordinary fantastic. No! The goal is to try to recognize those kids who are doing what you want them to do, even in the ordinary routine of your classroom. Try to help as many students get to the top if the chart as possible. If they are doing what you want them to do, then they are outstanding! My kids get a jewel to choose and glue on their clothespin at the end of the day, if they make it to outstanding. But they can also go above that, they can clip on the top of the chart, and they can clip off the chart behavior from there and clip onto me! They can clip on the bottom of my blouse, then up to my lanyard, and even up onto the sides of my eyeglasses arms! Boy, do they love that! If they complete their homework, they start the day with an automatic clip up on space. Very motivating which helps first graders remember to do it! And, they have a read to, read with, or be read to choice reading log to do with a parent for hw, and it has about 25 or 30 lines on it. When they have a log paper entirely filled out, they cut it out and glue it in their interactive notebook and then they get to pick a bonus jewel! Bonus jewels are larger or fancier, exceptionally sparkly, etc. In past classes, I have used the bonus jewels as a motivator to recognize 10 Accelerated Reader tests completed at or above the 85% score. The kids have between 1-2 specials a day, and they can earn a clip up, stay the same, or clip down from their specials teachers too, on a little clipboard chart. This rainbow behavior chart is the hub of my classroom and the boys clamor for the jewels just as much as the girls. When they have 5 jewels on a clip, it goes home and the start with a brand-new clip the next day. Boys will tell me things like how they pull off all the jewels and pretend it’s a pirate treasure in a special box, and girls will clip them in their doll’s hair or on their curtains. I even had a girl who gave them as a present to her mom, because she said good behavior was the best gift she thought her mom would like. One extremely impulsive and explosive little boy wanted to keep all his clips and jewels inside his paper/folder mailbox. I saw no reason why he couldn’t do that. Come to find out months later, that he kept them there to remind himself on bad choice days, that he has made better choices in the past, and that he can earn more with better choices on another day! Self-monitoring! This chart has been revolutionary in my room. I don’t use it to humiliate. Sometimes a clip down is done privately. If a behavior is done publically, I often will do tge clipping down. If we are in centers and kids are mobile, I will go over to tell the child to clip down and why, not call them out and embarress them and disrupt the class. Our rules are clear, and clip downs are simply a reminder to remember the rules and make better choices. Our rules are Be kind, Be respectful, and Be obedient. There is not shaming for breaking a rule, and my clip down requests are always done unemotionally. “I saw you deliberately walk into John’s side when you walked by him, which knocked him down. We need to remember that God commands us to be kind. Please go clip down. I will be watching to see you making kinder choices this afternoon so we can put that clip back up where we would like it to be. Thank you.” If a child refuses to clip down, they are given the choice to do so themselves, or I will do it for them. There are only 2 procedures regarding clips that first graders need reminders about: 1. Each person’s clip is their own personal business. If someone is higher or lower on the chart than you, it means they made a poor or wise choice that I needed to recognize. It isn’t your business to know what happened. Pay attention to your own clip. That’s a hard one for curious littles. We talk a lot about how minding our own business and not asking prying questions is part of being respectful. 2. Only I can decide what gets clipped up, and I am looking to catch you making wise choices. You can’t come up bragging to me about something you did. The rainbow clip chart is a phenomental tool when used correctly. I am a firm believer in avoiding the system. My teachers had this in elementary school, and the chart made it easy to feel negatively toward peers who moved their clip down. The chart was a point of pride for me, (obviously the teacher’s pet), but the ACTIONS that moved my clip up were not my pride. Now that I’m a teacher, I use public praise and private punishment as much as possible. Here is a better option if you are married to the system: If a child needs a behavior plan, keep it on a clipboard or binder for easy transport. You, the caregivers, and that student are the only ones with access to the clipboard–and you know what–keeping it on regular paper allows you to make copies to send home or keep for long term records. Plus you can take it to the fire drill with you and use it there in real time! This is my solution also. My administration believes strongly in public praise and private punishment. I use a clipboard to mark negative behavior and Class Dojo for positives.